Geof has been taking it easy, helping Fred & Ray restoring the siphon van. Geof has been painting (which is considerably better than panting, which he had been doing when working on the loco lately!). There was a bit of a rush on, as 2807 was to be in service this weekend ... and the ash pan was not yet completed! So, David settled down inside the firebox and spent all day welding in the new sections, especially the damper door surround (when I left, the damper door was still not fitted). 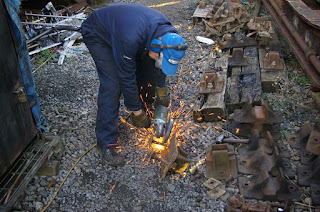 Gilbert was under the loco (in the pit) assisting David, and preparing to refit the damper door. Bruce began by acting as "gopher". For example, he cut off part of the head of two bolts, which otherwise would not fit into their holes in the ash pan due to being too close to something that was in the way. Thereafter, Bruce assisted the boot scraper cause by cutting off bolts from some of the chairs in the pile. John Mayell popped in, just to buy another boot scraper (a black one, this time). He was working on P-Way, so couldn't stay. I applied an enamel coat to the stock of part-painted chairs, building up the supply while the going was good. I was delighted (relieved!) to see 2807 at the head of the coaching stock as I arrived at Todders this morning. Also, she sounded great when she stormed off down the line at 10.30 (presumably straight through to Cheltenham to pick up the first load of Santa Special people). Understandably, I was the only one working (in our group) at Toddington today. Gilbert did pop in for a cuppa - he really wanted to speak to Rod in the workshop, but no sign of Rod. Gil said that he, Fred, Colin & Ann were all working on the siphon at Winchcombe. Later, Stu popped in to return sales stock, he having spent the morning at Toddington Village Hall for their Xmas sales day. So, I painted the lettering on a multitude of chairs and then stained 9 brushes in anticipation. Tim Pickthorn was using our TPO to show a couple of chaps how the buck-eye coupling works (I heard someone fiddling outside & went for a butcher's). Mark Young was hurtling around in the fork-lift truck, clearing up anything that didn't look as though the owner would miss it - there is a small quantity of staging that belongs to us that could do with moving round the other side of the TPO and tidying. 2807 will be in service on Sunday 8th Dec, and then again on Sunday 15th Dec.